Tango with live music by Kay Sleking & Friends, extra music workshops for dancers and every night the musiciens will play in the salon. Each Summer René & Gabriëlle hold a special week long tango workshop in L’Huys Préau, a manoir in the Morvan, in a beautiful part of Burgundy in Central France. Every year Préau organizes courses in various activities including visual arts, theatre improvisation, dance, music, nature, yoga, poetry and philosophy. L’Huys Préau offers private rooms, large luxurious tents, a theatre, a dance studio, a restaurant and 18 hectares of beautiful landscape and is full board. The Préau tango course is intended for different levels from Beginners to Advanced dancers: application is possible with or without a dance partner; please contact TangoTalks. Argentine tango is an improvisational dance, a subtile game between leader and follower and the music on the dance floor. In the studio of L’Huys Préau we will work with different levels from Beginners to Advanced dancers. During the day all classes are scheduled and every evening there is a Tango Salon to practise your steps and enjoy the music. * During the Mornings the Technique Classes are scheduled, about the posture and the embrace, the technique of walking, of turning (ochos & giros) and of course of the embellishments (adornos) for leaders and followers. * In the afternoon the regular Tango Classes are scheduled; we will treat some motives and combinations of steps and translate them into the music…we will play, combine and interprete the rich material of tango. 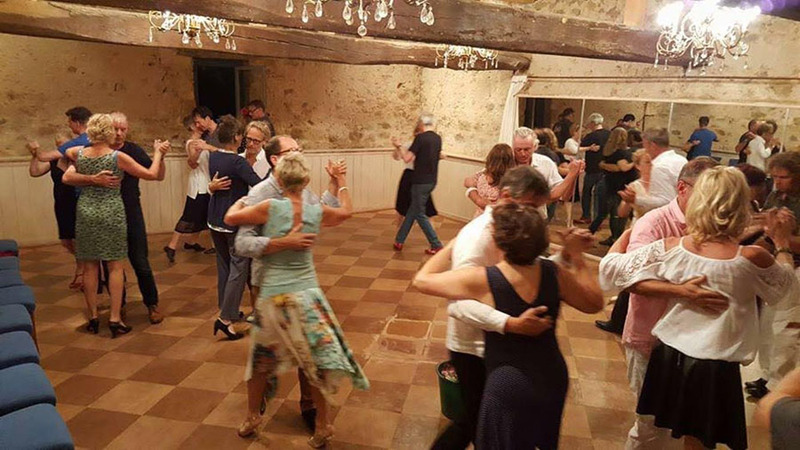 * Every evening there is a Tango Salon in the beautiful studio of L’Huys Préau with wooden floor; the bar will be open, the teachers will be there for some coaching and we will listen and dance to the beautiful and varied music of DJ El Chino.